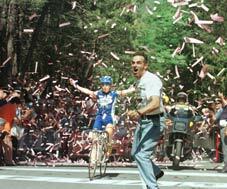 Our friends at Vittoria shoes sent us some interesting racing pictures. We thought you would enjoy them. 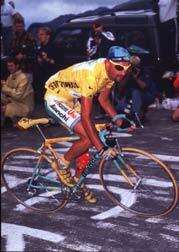 Marco Pantani in yellow in the 1998 Tour de France. 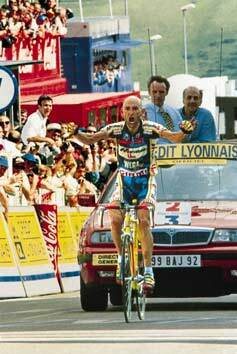 This is Pantani winning a stage; we believe it's the 1997 Tour de France. 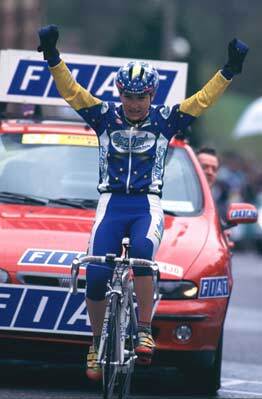 Pantani wins a stage in the 1998 Giro d'Italia. 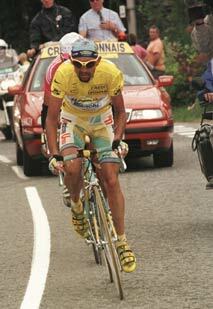 Pantani in yellow in the 1998 Tour de France. 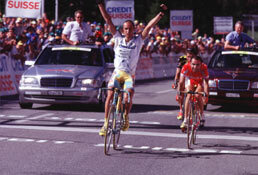 Stefano Garzelli winning a stage in the 1998 Tour of Switzerland. 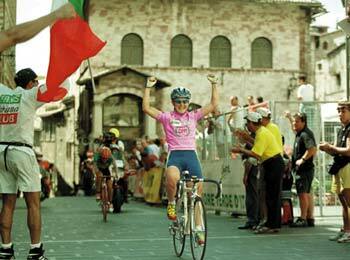 Fabiana Luperini wins the Assisi stage in the 1998 women's Giro d'Italia. Note from Chairman Bill: I know the hill she just came up is a really steep one---we were there on our trip;the exhaustion of the rider behind her is quite understandable. Fabiana's apparent lack of fatigue is astounding. For a view of Assisi from a distance, click here. For some other photos in and around Assisi, click here. 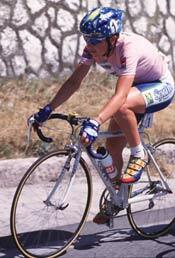 Luperini in pink in the 1998 women's Giro d'Italia.